Club Penguin Cheats by Mimo777 Club Penguin Cheats by Mimo777: New Igloo Experience Is Here! Check out what Happy77 says about the new iggy experience! 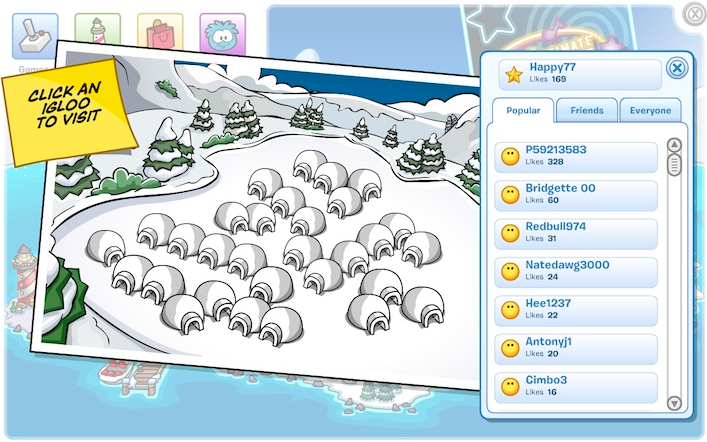 "We just released a brand new igloo experience on Club Penguin! Have you checked it out yet?" 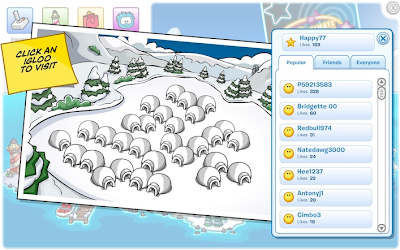 "We've already seen so many of you exploring all the unique and amazing igloos on the island. If you haven't had a chance to yet, go online and vote for your favorite igloo by pressing the Like button!" Cool! Go vote and check out all the changes and then let me know what you think! Did you know that if you press the down and up arrow keys while holding a furniture item(while editing igloo)it will change. Like if you buy the laser beams, hold that item and press the down arrow key and then presto!pink lasers start! if you press more times u will get blue, red, and green lasers! That's Cool!